Excalibur is forced to fight the original X-Men. 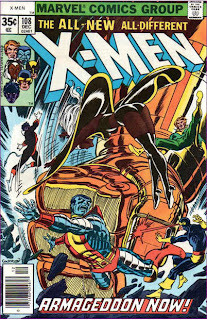 Auditioning to become Dr. Doom's personal assassin, Sidestep targets Excalibur, using his power to pit each member of the team and against a member of the original X-Men, plucked from the past and inserted into a different historical time period, with the X-Men having home field advantage in each era. 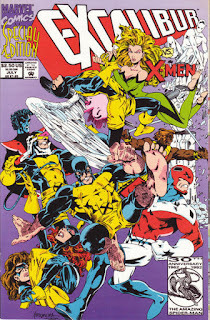 One by one the members of Excalibur defeat the X-Men, Frustrated, Sidestep brings both teams to the present, before Doom, and the X-Men attack. But Professor X, using Nightcrawler's astral self as a temporal anchor, reads Sidestep's mind and learns all his power comes from his vest, a lost weapon of the Kree. 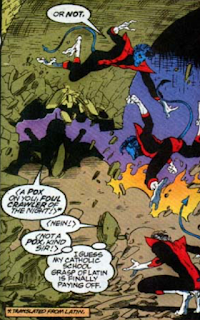 With that knowledge, Nightcrawler teleports the vest away from Sidestep, at which point both Excalibur and the X-Men are returned to their places of origin. Dr. Doom proceeds to dispatch the now-powerless Sidestep, then calls forth the next applicant. Drawing the chapter featuring Beast and Nightcrawler, this issue features the first work from future Uncanny X-Men artist Joe Maduerira in an X-book. This is the first and (I assume) only appearance of Sidestep, a would-be assassin who harnessed a Kree weapon to give himself the power to shunt people through space and time. He is auditioning to become Dr. Doom's personal assassin, and citing Doom's encounter with Excalibur in issues #37-39, proposes to kill the team on his behalf. Another extra length special issue, this is meant to represent Excalibur's 1992 annual. It's the final non-annual annual for the series, as the book will receive it's first official annual next year. This issue takes place between Excalibur #54 and #55. Captain Britain wonders if Sidestep's power is more "Cross-Time madness", reminding us that Phoenix sacrificed herself to end it. 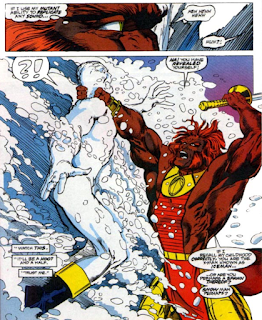 Kylun uses his sound mimicry power to scare Iceman into revealing himself. 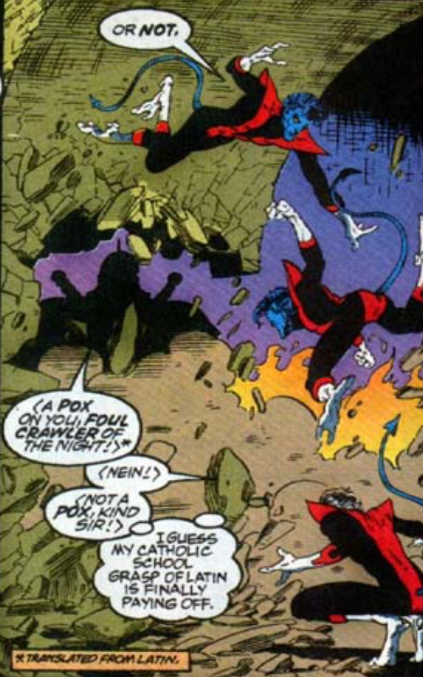 Nightcrawler apparently knows "Catholic school" Latin, though I believe he means Latin on the level of what one would learn in a Catholic school, as I doubt he ever attended one himself. In a vacuum, there's a lot to enjoy about this issue. The collection of artists (including a young Joe Madureira) isn't bad (like all such things, it's hit-or-misses, but there's more of the former than the latter), I'm a sucker for anything involving the original X-Men, and the historical angle (setting the pairings in different time periods, with the X-Men automatically acclimated to the time) is a lot of fun, punching up a pretty typical "hero vs. brainwashed hero" plot device. Using Dr. Doom in the framing sequence is a nice nod to the series' history, and if Sidestep is a laughable and ludicrously overpowered foe, he fits the more silly tone of the series, and his casual dismissal by Doom at the end is legitimately funny. But here's the rub: this issue doesn't exist in a vacuum, and that's its biggest problem. This is the second consecutive Excalibur annual/special/thingee to go the route of "split the team up into separate parts, beginning and ending with a chapter where they're all together", and thus reading an awful lot like a reclaimed Marvel Comics Presents story (Air Apparent also wasn't the first Excalibur story to use that device, including at one actual MCP story). It's also at least the third time an Excalibur story feints at having the title characters interact with the X-Men, only to have the X-Men turn out to be something other than the real deals. Fool me once, etc. So whatever merits this issue might otherwise have (and there is some legitimately fun stuff here) are overshadowed by just how repetitive it feels, in terms of both structure and content. Tomorrow, more fun in Japan in Wolverine #56. Next week, Uncanny X-Men #290 and X-Force #12. I guess somebody in editorial liked Joe Mad, since he's given cover privileges on this one rather than one of the more accomplished artists like Lightle or Leonardi -- plus he gets a two-part fill-in on the main EXCLAIBUR book just a few months from now, too. Our neophyte, self-proclaimed “wannabe” villain displays enormous power that by his own admission could effect the immediate death of all Excalibur, which can only mean that he’s going to be defeated by his own hubris and/or stupidity. That said, I agree with you on how there was a fair amount to enjoy here — and that said, I agree with you on how it’s at least one example of its kind too many. I did get a kick out of how Scott's angst over the ol' awesome, terrible power of Cyclops was translated to his Revolutionary War incarnation. Good for a laugh of a different sort was Kurt, using that “Catholic school grasp of Latin” you pointed out, to exclaim “Nein!” — in caret/arrowhead brackets, within its own word balloon. So he's speaking... German… in Latin? One thing I actually really liked but am unsure Lobdell intended: Kitty says that she’s “familiar enough with ancient history to know the Lady of the Lake should have final dibs on the enchanted blade.” Now, Arthurian legend is just that, legend, especially the mystical stuff like Excalibur the sword and the Lady of the Lake — but even if characters from that legend hadn’t appeared in the present day, and even if Excalibur the team hadn’t actually met a version of Merlin, it makes sense to me that Arthurian legend would be considered history rather than myth in the Marvel Universe. It's hard to pass without noting that Scott reprises his role as a Revolutionary War soldier he had in Mastermind's illusion during the DPS in UXM #133. I bought this issue because the original X-men appeared on the cover. At the time, I like Joe Madureira's art, but (like every other 90s superstar), he was never given any schooling, or you know, advice, and so he simply skipped directly from teenage prodigy to million dollar superstar. His early work showed promise, but like any artist that doesn't hone their craft, he simply began exaggerating his own shortcomings, culminating in the disastrous 'Ultimates 3' book, where air-brushed computer colours made things even worse. Marvel Comics Presents #101-108: "Male Bonding"